Pepsico’s H2Oh! flavoured water, a popular drink in South America, is presented as the drink everyone loves in “Braids” (Trencitas), a television commercial which won a Gold Film Lion at Cannes International Advertising Festival 2011. 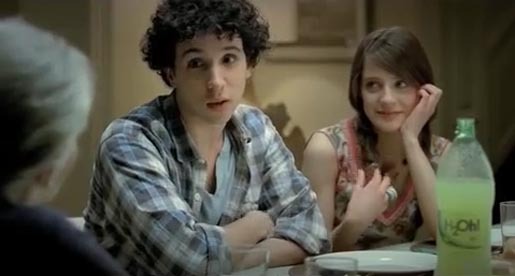 Launched in January 2011, the commercial shows a girl bringing her boyfriend to meet the family. As each member of the family interacts with the new guy, he or she imitates the twirling of braided hair first modeled by the girlfriend. The Braids commercial was developed at BBDO, Argentina, by executive creative directors Rodrigo Grau, Ramiro Rodríguez Cohen, creative directors Gabriel Huici, Jorge Ponce Betti, copywriter Roberto Espino, art directors Joaquín Campins and Frodo, agency producers Rodrigo Lema and Carlos Cavaciocchi, head of TV department Verónica Zeta, account managers Daniel Albamonte, Paz Goicoa, working with advertiser’s supervisors Federico Bluthgen, Hernán Tantardini, Alejandro Laborde, Richard Rodríguez. Filming was shot by director Augusto Giménez Zapiola via Argentinacine with executive producers Marcos Landajo and Nano Tidone, director of photography Julián Ledesma and editor Leandro Aste. Post production was done at Metrovision. Sound was produced at La Casa Post. Music was produced at Supercharango.